Topical collection: Risk Analysis The concept of expected losses is an appropriate measure for integrating risk in the determination of the optimal rotation period and choice of tree species. Context. Natural threats are challenging forest management decisions. 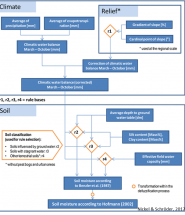 Fuzzy modelling and mapping soil moisture for observed periods and climate scenarios. An alternative for dynamic modelling at the national and regional scale?